Ladies! For so many of us, the thought of taking command of our finances is daunting -- but it doesn't need to be. Join us for monthly happy hours, from April 11th to June, to learn strategies on becoming more secure with your personal finances – retirement, planning for aging parents, budgeting, saving, how to talk to your spouse about money. 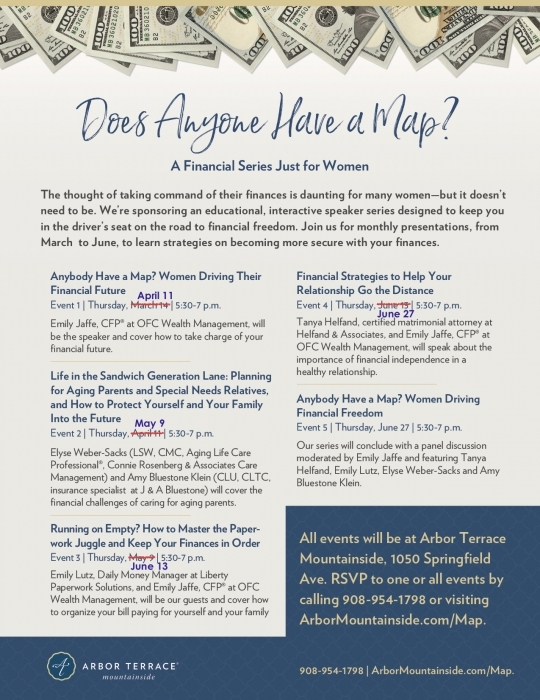 It’s also for moms who want to raise financially fit children; and for adult children who want to talk about finances with their aging parents. There is no sales pitch – just helpful solutions on where/how to begin and a roadmap to take back some financial control and well-being. Join us for some or all the events. Bring a girlfriend and make it a girls’ night.